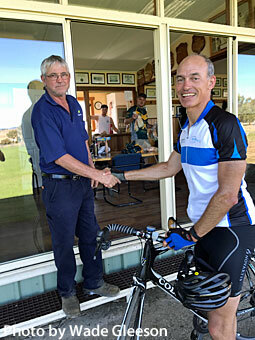 ride for diabetes last weekend. AFTER Week 1 of the Southern Cricket Association Finals, four of the six local teams remain in contention. The New Norfolk club fared particularly well with two of its three teams getting a win. Of those, New Norfolk II is now just one win away from glory and Bothwell I went one step closer with a good win over Bushy Park who now bow out. New Norfolk I kept its finals dream alive, recording its seventh win in succession. Playing in the do-or-die elimination final and being one-all during the roster matches with Old Beach, the Red Caps came home with the goods, landing a five-wicket win. Playing at Old Beach. The home side won the toss, elected to bat and made the competitive total of 10/83 off its 50 overs. In reply New Norfolk reached the required runs with five wickets in hand and 6.5 overs remaining. Seb Wishart let the bat do the talking with a fine 66 in an innings-building score. David Maddox used his experience with a well put together 28 not out, as did Stewart Rice with a handy 27. Harry Booth made 16 and Jason Rigby 15, while Nathan Eiszele did his bit to remain 14no. With the ball, Jason Rigby led from the front with good figures of 3-29 (10) including four maidens. Joe McCulloch 3-36 (10) and Nathan Eiszele with 3-47 (10) including three maidens were just as good. Seb Wishart chipped in with 1-39 (10). This Red Caps side has come good at the pointy end of the season and if the train can keep rolling along, then anything is possible. on winning the Adrian Eiszele Medal. 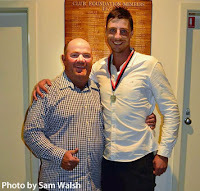 Well done to New Norfolk's Jason Rigby who after a great match on Saturday, went on to win the Adrian Eiszele Medal that night. Rigby won with 22 votes, six clear of runner-up Cody Morgan-Coleman on 16 votes. Jake Bearman was third on 13 votes. Top-of-the ladder Molesworth I went down to Montagu Bay by four wickets. Batting first, Molesworth was bowled out for 166 off 42.1 overs. In reply, the Sharks finished 6/169 off 39.1 overs. Of their batsmen, only two made double figures. One was their opener who remained 103no and this was the difference. With the bat for Molesworth, Nick Piuselli continued his good form making 60 (five fours and three sixes). Captain Jamie Adams was next with 38 (four fours, one six), Brad Coppleman 15 (one four l, one six) and Brad Ransley 14 (two fours, one six). Opener Jeremy Bichols was the best of the bowlers with 2 for 10 off seven overs (four maidens). New Norfolk II advanced straight to the grand final with a good close win over Bagdad in the second semi-final at Tynwald Park. The home side won the toss and sent Bagdad into bat. Th visitors made 10/146 off 46.5 overs. In reply, New Norfolk didn't get off to a good start and found itself in a big hole at 7/64. A 35-run partnership from Todd Rusher and Aaron Drew got the team to 8/99, but 48 more runs were still required. A partnership was needed and Todd Rusher 20 and Josh Walsh put on 25 before Rusher was out LBW. With just one wicket in the sheds and needing 23 for victory, New Norfolk needed some heroes with cool heads and experience. They got it from Josh Walsh 11no (one four) and Cody Morgan-Coleman 12no with the pair putting on an unbeaten stand and getting the Red Caps over the line and into the big dance in two weeks time. Earlier, Aaron Drew made 23 (one four, one six) and Leigh 21 (two fours). With the ball, Jamie Hill stood tall for his team capturing 4-39 off 6.5 overs. Man-of-the-moment Walsh took 2-26 off his 10 overs while Nathan Rice sent down six overs to finish with the excellent figures of 1-9 off six overs. Next was Cody Morgan-Coleman and Aaron Drew who picked up one wicket each. It was mighty effort when the chips were down. Bothwell I kept its good form rolling with a four-wicket win over Bushy Park in the first semi-final at Bothwell. Winning the toss and batting first, Bushy Park made the competitive score of 10/156 off 32 overs. In reply, Bothwell had little trouble in reaching the target, finishing 6/157 off 30.4 overs. Bothwell captain Cody Eyles set the example with a well put together 46. Nathan White did likewise making 32no. Old hand Joey Eyles opened the batting, making 24. Michael White made 21. Earlier, Matthew Eyles did his usual bit, bowling very well and taking 4-42 off nine overs. Nathan White opened the bowling and took 3-56 off his 10 overs, while Craig Pursell took 2-43 (7) and Brick Nichols 1-4 (6). It was very good win for the Bucks and they now play on for another week. No statastics were available for Bushy Park at the time of writing. Playing at Gretna, New Norfolk II was defeated by Wellington by six wickets in the first semi-final. After winning the toss, New Norfolk had first hit and that's where its finished with the Red Caps being bowled out for 96 off 31.1 overs. In reply, Wellington got the job done, finishing 4/100 off 24.5 overs. Stuart Muir did well with the ball, capturing all four wickets. No other stats were available at the time of writing. It was not the result the young Red Caps were after, but the boys should hold their heads very high as it is a big achievement making finals.